Edition of young men’s magazines from just before the First World War, presenting a vivid and touching picture of life at the time. 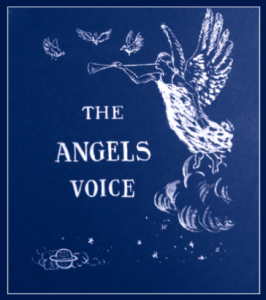 The Angels’ Voice was the title given to a magazine which circulated among a group of some 40 or so young men in Brixton between 1910 and 1913, all members of the Young Men’s Bible Class of Trinity Congregational Church there. In its pages they teased each other, their sisters and girlfriends in poetry, drawings and witty, innocent articles. We see them playing football, going on country rambles, roller-skating, cycling, smoking (a lot), arguing about politics and women’s rights, taking day trips to France and holidays in the Channel Islands, Belgium and Italy, and even working in Switzerland, India and the Canary Islands. This magazine offers an unique insight into life in London in general, and the lives and attitudes of lower middle-class young men in one suburb in particular, on the eve of the outbreak of the First World War, during which many of them were to serve and several of them were to die; its pages depict the world lost in the trenches of France and Flanders. The magazines are presented here with an introduction and full notes, with an appendix providing biographical information on many of those connected with them. Alan Argent grew up in south London. He is minister of Trinity Congregational Church, Brixton, and Research Fellow at Dr Williams’s Library, London. He has written a biography of Elsie Chamberlain, and a history of Congregationalism in the twentieth century.